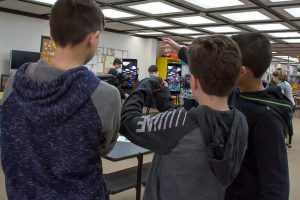 Warwick Valley Middle School students were treated to a visit from Google and a sneak peek at the Expeditions Augmented Reality Pioneer Program. 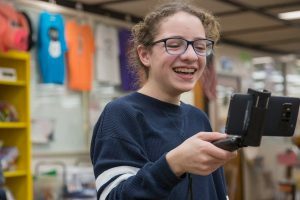 With smartphones attached to selfie sticks, the students viewed three-dimensional moving images as if they were happening right there in the Middle School Media Center, including planets, a whirling strand of DNA, a tornado, even a giant lobster. With it Expeditions AR, teachers and students map the classroom with QR codes placed on desks, creating “expeditions” – a visit to the moon, for example. When the phones are placed over the codes the students see a Michelangelo, or a T-rex, or whatever the teacher has selected. Students can get up close to see detail, walk around for different perspectives, or step back for a sense of scale. A Google expert was on hand and brought the phones and selfie sticks.